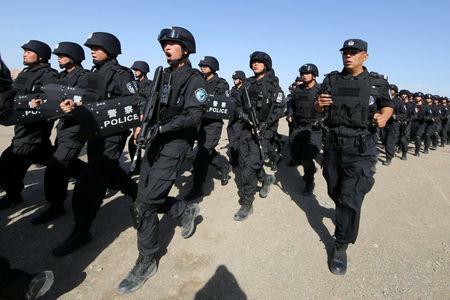 BEIJING (Reuters) - Spending on security-related construction tripled in 2017 in China's far western region of Xinjiang, where Beijing is accused of detaining as many as one million ethnic Uighurs and other Muslims, an academic analysis of government expenditure found. Beijing says its "vocational training centres" in Xinjiang camps teach employment skills and legal knowledge aimed at curbing religious extremism. The report published on Monday by U.S. think-tank the Jamestown Foundation examined government budget data and found spending on security-related construction in Xinjiang rose last year by nearly 20 billion yuan ($2.90 billion), or 213 percent. "Xinjiang's budget figures do not reflect increased spending on vocational education ... as the region ramped up camp construction; nor do they reflect an increase in criminal cases handled by courts and prosecutors," said the report's author, Adrian Zenz, an anthropologist at the European School of Culture and Theology in Germany. "Rather, they reflect patterns of spending consistent with the construction and operation of highly secure political re-education camps designed to imprison hundreds of thousands of Uyghurs with minimal due process." It also found that despite the purported large "vocational training" campaign, employment outcomes had not markedly improved, according to Xinjiang's own official employment figures. The Xinjiang government and the State Council Information Office, which doubles as the Communist Party's spokesman's office, did not immediately respond to requests for comment. On Tuesday, foreign ministry spokeswoman Hua Chunying said she did not personally know how much Xinjiang's security expenditure was. Speaking at a daily news briefing, she asked whether Jamestown had also looked into how much money the Xinjiang local government had spent "developing the economy and improving lives". Reports of mass detentions and strict surveillance of ethnic Uighurs and other Muslims have prompted the United States to consider sanctions against officials and companies linked to accusations of human rights abuses. After initial blanket denials, Chinese officials said in recent weeks they were not enforcing arbitrary detention and political re-education across a network of secret camps, but rather that some citizens guilty of "minor offences" were sent to vocational centres to provide employment opportunities. While prison expenditure doubled between 2016 and 2017, spending on prosecution on criminal suspects was largely flat, Zenz said, indicating it was likely that few of the so-called criminals involved only in minor offences were put on formal trial. China's record will be examined by the U.N. Human Rights Council on Tuesday, the first time since 2013, in a regular review expected to focus on its treatment of ethnic minorities, especially Uighurs and Tibetans.